Attempted unauthorized crossings at the U.S.-Mexico border soared to the highest levels in over a decade. The trade deficit rose by more than $100 billion — 23.5 percent. The economy added 5.1 million jobs; unemployment fell to the lowest rate in nearly half a century. Economic growth picked up, but fell short of what Trump promised. The number of restrictions in the federal rulebook stopped growing, and fell a bit. 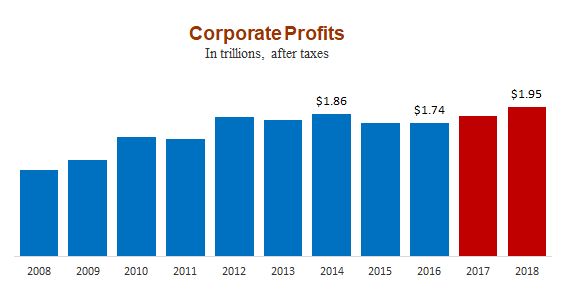 After-tax corporate profits hit record levels. Stock prices rose. Carbon emissions, which had been falling, rose 2 percent. At least 1 million fewer people have health insurance (7 million according to Gallup). One-fifth of the judges on federal appeals courts have been installed by Trump. This is our fifth quarterly update of the “Trump’s Numbers” scorecard that we posted in January 2018 and have updated every three months, most recently on Jan. 16. We’ll publish additional updates every three months, as fresh statistics become available. Here we’ve included statistics that may seem good or bad or just neutral, depending on the reader’s point of view. That’s the way we did it when we posted our first “Obama’s Numbers” article more than six years ago — and in the quarterly updates and final summary that followed. And we’ve maintained the same practice under Trump. Then as now, we make no judgment as to how much credit or blame any president deserves for things that happen during his time in office. Opinions differ on that. Job growth slowed a bit under Trump, but unemployment dropped to the lowest level in nearly half a century. Employment — Total nonfarm employment grew by 5,121,000 during the president’s first 26 months in office, according to the most recent figures available from the Bureau of Labor Statistics. That continued an unbroken chain of monthly gains in total employment that started in October 2010. The average monthly gain under Trump so far is 197,000 — compared with an average monthly gain of 217,000 during Obama’s second term. The Bureau of Labor Statistics now figures the rate was 4.7 percent when he was sworn in. The most recent rate, for March, is 3.8 percent. It had been as low as 3.7 percent in September and November of last year. That was the lowest since December 1969. The jobless rate has been at or below 4 percent for the most recent 13 months on record. It hasn’t been that low for that long since a 50-month streak ending in January 1970. Job Openings — Another reason employment growth has slowed is a shortage of qualified workers. The number of unfilled job openings hit more than 7.6 million in November, the highest in the 18 years the BLS has tracked this figure. As of the last day of February, the most recent figure on record, it was still nearly 7.1 million. That’s a gain of 1,463,000 unfilled job openings — or 26.0 percent — since Trump took office. For the first time on record the number of job openings exceeded the number of unemployed people looking for work in March of last year, and in every month since. Since Trump took office, the rate has fluctuated in a narrow range between 63.2 percent and 62.7 percent. It was 63.0 percent in March — up just 0.1 percentage point from where it was the month Trump took office. Manufacturing Jobs — Manufacturing jobs increased under Trump, just at a rate slightly faster than total employment. The number rose by 453,000 between Trump’s inauguration and March. That followed a net decrease of 192,000 under Obama. The increase since January 2017 amounts to 3.7 percent, compared with the 3.5 percent increase in overall employment. The number of manufacturing jobs is still 920,000 below where it was in December 2007, at the start of the Great Recession. The economy grew somewhat faster under Trump — but not at the rate he promised. Gross domestic product was 2.9 percent higher in 2018 than the year before, according to the U.S. Commerce Department’s Bureau of Economic Analysis. The economy grew only 2.2 percent during his first year, and 2.9 percent for all of 2018, according to the BEA. It spurted briefly to a 4.2 percent annual rate in the second quarter of 2018, prompting Trump to proudly claim credit. But it then fell back to a 3.4 percent rate in the third quarter and a 2.2 percent rate in the final quarter. Most economists believe this year’s growth will be less than last year’s. CBO’s most recent economic outlook, issued Jan. 28, projects real GDP growth falling to 2.7 percent this year and 1.9 percent next year. And the even more recent median forecast of the Federal Reserve Board members and Federal Reserve Bank presidents, issued on March 20, projects only 2.1 percent growth this year and 1.9 percent in 2020. Other leading economists tend to agree that economic growth is slowing. For the business and university economists who offered an annual GDP forecast to the Wall Street Journal’s monthly economic survey in March, the average prediction was for 2.1 percent growth this year and 1.7 percent next year. The National Association for Business Economics’ March survey was only a little more optimistic, producing a median forecast of 2.4 percent growth for this year and 2.0 percent in 2020. The White House website proclaimed: “Economic Growth Has Reached 3 Percent for the First Time in More than a Decade.” But that’s not true. As we’ve said, growth fell just short of 3 percent when measured by the usual economic yardstick. And even using Trump’s measure, it grew faster than 3 percent less than four years ago. The White House Council of Economic Advisers issued a carefully worded explanation that growth was 3.1 percent (later revised down to 3.0 percent) — if measured by comparing the final three months of 2018 with the same quarter a year earlier. That’s correct, as far as it goes. And it is also the first time since 2005 that this final-quarter to final-quarter measure was 3 percent or better, as far as that goes. But year-to-year economic growth is normally measured by comparing the GDP for all of 2018 with the GDP for all of 2017. That change was 2.9 percent, as we have said, and was just equal to the growth in 2015, only three years earlier. 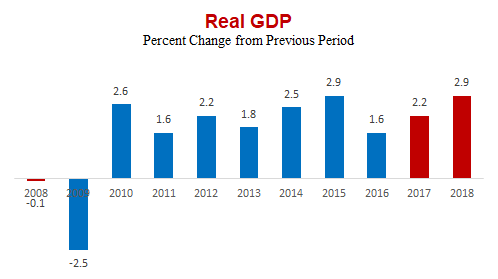 Furthermore, the White House claim that growth was the best in 13 years rests on cherry-picking only the final quarters of each year from BEA’s Table 1.1.11, which gives the 12-month change in real GDP ending in each quarter. And by that measure the economy grew faster — 3.4 percent — as recently as the 12 months ending in the second quarter of 2015, just three-and-a-half years earlier. The growth of federal regulation has stopped under Trump. 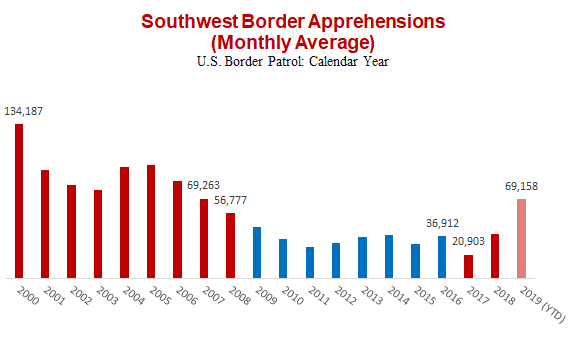 It wasn’t exactly the “sudden, screeching and beautiful halt” Trump prematurely claimed back in December 2017, when in fact the number of federal restrictions was still growing. But over the next several months the rise decelerated, and then reversed. The number of restrictions has now dropped to just below where it was when Trump was sworn in. But as of April 9, 2019, the number had dropped back below 1.08 million — 864 fewer than on Jan. 20, 2017, the day Trump took office. In percentage terms, the drop is less than one-tenth of 1 percent. That small drop is a big change from the past. Restrictions grew at an average of 1.5 percent per year during both the Obama years and the George W. Bush years, according to annual QuantGov tracking. Some of the recent changes are just clearing deadwood. In March, for example, the Internal Revenue Service removed 296 regulations that it said “are no longer necessary because they do not have any current or future applicability.” And last year the Treasury Department scrapped an entire chapter of zombie-like regulations issued by the old Office of Thrift Supervision, which oversaw the savings-and-loan industry before being abolished in 2011. S&Ls have since fallen under other federal banking regulators, but the obsolete OTS rules remained on the books. Crime declined during Trump’s first year, and the downward trend accelerated in the first half of 2018. Preliminary FBI statistics, released Feb. 25, show the number of violent crimes went down 4.3 percent in the first half of last year, compared with the same period in 2017. The number of property crimes declined even more, 7.2 percent. That followed a 0.2 percent decline in violent crimes and a 3 percent drop in property crimes during all of 2017, according to the FBI’s annual Crime in the United States report. Nationwide FBI figures for 2018, which include crime rates per 100,000 inhabitants, won’t be released until later this year, likely in September. Crime had been rising during the two years before Trump took office, a trend he greatly exaggerated when he was a candidate. During his campaign, Trump repeatedly and falsely claimed that the murder rate was “the highest it’s been in 45 years.” In fact, the murder rate had dropped to the lowest on record in 2014 — 4.4 murders per 100,000 inhabitants. And while it did rise for the next two years, it was still only 5.4 per 100,000 in 2016, far below the peak rate of 10.2 reached in 1980. A revised total of 35,600 coal mining jobs disappeared during the Obama years, but as of February, only 1,900 of them had come back since Trump took office, according to BLS figures. The outlook for coal miners remains bleak. The Energy Information Administration currently estimates that U.S. coal production fell 2 percent last year and will fall 9 percent this year and by another 6 percent in 2020. EIA expects natural gas will continue to displace coal for the generation of electricity. Carbon Emissions — Carbon dioxide emissions from energy consumption are now going up under Trump, after falling for years. Figures from the Energy Information Administration show CO2 emissions fell by a total of 14.5 percent between 2007 and 2017, due mainly to electric utilities shifting away from coal-fired plants in favor of cheaper, cleaner natural gas, as well as solar and wind power. After Trump took office, CO2 emissions fell more slowly at first — by 0.8 percent in 2017, half the 1.8 percent decline in Obama’s final year. And the trend has now reversed entirely. Emissions during the most recent 12 months on record, ending in December 2018, were 2.0 percent higher than in all of 2016. EIA said the 2018 rise is due mainly to a hotter summer and colder winter that resulted in higher natural gas consumption. It predicted that CO2 emissions would fall by 1.6 percent in 2019 and 1.0 percent in 2020, if temperatures return to normal as forecast. But even if those future reductions materialize, it would leave a net gain in total carbon emissions since Trump took office. Illegal border crossings are surging under Trump, to the highest levels in over a decade. Last month more than 92,000 people were apprehended trying to cross the U.S.-Mexico border without permission — the highest monthly total since April 2007. That number dropped during Trump’s first few months in office, hitting a low of 11,127 in April 2017. But the trend has been strongly upward since then, and has lately accelerated. For the most recent 12 months on record, the monthly average was 48,672 which is 31.9 percent higher than the monthly average of 36,912 in 2016. We use this rolling monthly average for our chart, because these monthly figures are subject to wide seasonal variations. In the last three months, however, the number of unauthorized crossings has spiked even higher — beyond anything seen in nearly a dozen years. The monthly average so far this year is over 69,000, higher than the monthly average for any full year since 2007. Of those apprehended in March, less than one-third were single adults. Rather, 57 percent were part of “family units” made up of a child under 18 accompanied by a parent or guardian, and nearly 10 percent were unaccompanied children. Border Patrol officials said they are coming primarily from Guatemala, Honduras and El Salvador, and many are seeking asylum. It’s a big change from the days when most such attempted border crossings were made by Mexican males seeking work. After-tax corporate profits are running at record levels under Trump. During 2018, they hit $1.95 trillion, eclipsing the previous annual record set under Obama. Last year’s after-tax profits were 12 percent higher than the full-year figure for 2016, the year before Trump took office. They also were 4.9 percent above the best previous full-year figure, which was $1.86 trillion in 2014. These annual (and also quarterly) estimates originate with the Bureau of Economic Analysis (see line 45). After-tax profits got a boost in 2018 from the tax cut Trump signed into law Dec. 22, 2017, dropping the top federal tax rate on corporate income to 21 percent, from 35 percent. Profits before taxes (line 43) actually edged down by about one-tenth of 1 percent last year, and were 3.7 percent below the 2014 level. Stock prices continued their long rise with Trump in office — though it’s been a bumpy ride. Market indexes set record after record last year — only to see much of the gain erased in the worst December since 1931. But that was followed this year by the best first quarter in a decade. At the close on April 10, the Standard & Poor’s 500-stock average was just 1.5 percent below the record high set on Sept. 20, 2018, and 27.6 percent higher than it was on the last trading day before Trump’s inauguration. Other indexes took similar rebounds. At the April 10 close, the Dow Jones Industrial Average, made up of 30 large corporations, was up 32.6 percent under Trump. And the NASDAQ composite index, made up of more than 3,000 companies, was 43.8 percent higher than before Trump took office. The bull market began its rise in the depths of the Great Recession in 2009, and became the longest in history last year. This year it passed its 10th anniversary in March. CPI —The Consumer Price Index rose 4.3 percent during Trump’s first 26 months, continuing a long period of historically low inflation. In the most recent 12 months, ending in March, the CPI rose 1.9 percent. The CPI rose an average of 1.8 percent each year of the Obama presidency (measured as the 12-month change ending each January), and an average of 2.4 percent during each of George W. Bush’s years. The average weekly earnings of all private-sector workers, in “real” (inflation-adjusted) terms, rose 2.6 percent during Trump’s first 26 months (ending in March) after going up 3.9 percent during the previous four years. For rank-and-file production and nonsupervisory workers (who make up 82 percent of all private-sector workers), real weekly earnings have gone up 2.5 percent so far under Trump, after rising 4.9 percent during Obama’s last four years in office. Consumer confidence in the economy rose under Trump, then dropped back again. The University of Michigan’s Surveys of Consumers reported that its Index of Consumer Sentiment hit 101.4 in March of last year, which was the highest in more than 15 years. For all of 2018 the level averaged 98.4, which was the best full-year average since 2000. But from there it slid to 91.2 in January — exactly where it had been in September 2016, before Trump was elected. The most recent sales figures from the National Association of Realtors show the national median price of an existing, single-family home sold in February was $251,400. Earlier, in June 2018, the median monthly price peaked at $276,500 — the highest ever recorded. The median for all of 2018 was $261,600, the highest full-year figure on record. But even though prices fell back in subsequent months, the February median is still $22,700 higher than the median price of $228,700 for homes sold during the month Trump took office — a gain in value of 9.9 percent. The rise in the Consumer Price Index during the same period was 3.8 percent. The Realtors’ figures reflect raw sales prices without attempting to adjust for such factors as variations in the size, location, age or condition of the homes sold in a given month or year. Even so, a similar pattern emerges from the S&P CoreLogic Case-Shiller U.S. National Home Price Index, which compares sales prices of similar homes and seeks to measure changes in the total value of all existing single-family housing stock. The Case-Shiller index for January sales (the most recent available) was 10.5 percent higher than where it stood in the month Trump took office. Homeownership — Meanwhile, the percentage of Americans who own their homes has continued to recover from a years-long slide, gaining 1.1 percentage points since Trump took office. The rate recovered 0.8 points before Trump took office, and has gone up another 1.1 points since then, reaching 64.8 percent in the fourth quarter of 2018, according to the most recent Census Bureau figures. But it is still 4.4 points below the peak level of 15 years earlier. The trade deficit that Trump promised to reduce grew much larger instead. The most recent government figures show that the total U.S. trade deficit in goods and services during the most recent 12 months on record (ending in January) was $622 billion. That’s an increase of $118 billion, or 23.5 percent, compared with 2016. China — The goods-and-services trade deficit with China grew at a similar pace, up by 22.8 percent between 2016 and the most recent 12 months on record, ending in December, when it hit nearly $379 billion. Trump last year initiated a full-scale trade conflict with China, imposing tariffs on $250 billion worth of Chinese goods. China has retaliated with its own tariffs on $110 billion of U.S. goods. Trump tweeted Jan. 8 that talks to strike a new trade deal with China are going “very well,” but so far no deal has been announced. Mexico — Meanwhile, the much smaller trade deficit in goods and services with Mexico totaled $78 billion during the 12 months ending in December, an increase of 25.8 percent compared with 2016. Canada — The trade surplus that the U.S. runs with Canada has practically disappeared under Trump. The trade balance was positive by a scant $1.2 billion during the 12 months ending in December. That surplus is 83.6 percent smaller than it was in 2016. On Nov. 30 Trump and the leaders of Canada and Mexico signed a new trade agreement to replace the 25-year-old North American Free Trade Agreement, which Trump had promised to scrap during his campaign. The new agreement will be called the United States-Mexico-Canada Agreement, or USMCA. The new agreement still requires approval by Congress before it can take effect. The number of people lacking health insurance has risen by more than 1 million under Trump, and millions more are expected to drop or lose coverage this year. The rise compared with 2016 was about 1.1 million as of the first nine months of 2018, according to the most recent report from the National Health Interview Survey, issued Feb. 27. The NHIS said 9.2 percent of the population lacked coverage during the period, up from 9.0 percent in 2016. A much greater rise was reported by a Gallup survey covering the final quarter of 2018. Gallup on Jan. 23 put the rise in uninsured adults at about 7 million, compared with the last half of 2016. Gallup put the percentage of uninsured adults at 13.7 percent in the October-December quarter. The NHIS figure took a big jump from the data we reported in January, when 100,000 fewer people were listed as lacking covering during the first six months of last year, compared with 2016. The NHIS doesn’t break out the total number of uninsured people for each quarter, but clearly there was a very large increase in the third quarter of 2018. The NHIS estimate for all of 2018 is expected sometime in May, and we will cover it in our next update. Trump failed to “repeal and replace” the Affordable Care Act as he promised to do, but did slash advertising and outreach aimed at enrolling people in Obamacare plans. In December 2017 he signed a tax bill that ended the ACA’s tax penalty for people who fail to obtain coverage, effective this year. And in March the Trump administration joined an effort by GOP state attorneys general seeking a court decision to overturn the entire act. The nonpartisan Congressional Budget Office estimated in May 2018 that with the end of the mandate penalty 3 million people will drop or lose coverage this year, and another 2 million in 2020. The number of food stamp recipients has gone down since Trump’s inauguration. As of January, the most recent month for which figures are available, 38.1 million people were receiving the aid. The number has gone down 4.4 million, or 10.4 percent, since January 2017, when Trump took office. In December, the Trump administration issued a proposed rule that would tighten work requirements for able-bodied adults between the ages of 18 and 49, with no dependents. Generally, the rules limit aid to three months for such adults, but many states secured waivers to that rule during the 2007-2009 recession and still have them in place, despite a booming economy. Trump’s proposal would affect only a fraction of all food stamp recipients, however. Less than 9 percent of all people getting food stamps are classified as able-bodied adults living in households without children, and 26 percent of those are already working, according to the U.S. Department of Agriculture. Trump is putting his mark on the federal appeals courts more quickly than Obama was able to do in his time in office. Court of Appeals — Trump also won confirmation of 37 U.S. Court of Appeals judges (30 during his first two years and another seven in the current Congress as of April 9). That’s more than double the total for Obama, who won confirmation for only 18 as of the same point in his first term (14 during his first two years and two more in the 112th Congress as of April 8, 2011). Trump has now installed nearly 21 percent of all the 179 appellate court judges authorized by federal law. District Court — When it comes to the lower courts, Trump has just pulled ahead of Obama. With the confirmation of the latest two judges on April 10– to seats on federal courts in Texas and Indiana — he has won confirmation for 58 of his nominees to be federal District Court judges (nearly 9 percent of the 677 authorized district judges), while Obama had won confirmation for 57 at the same point in his presidency. The federal debt held by the public stood at over $16.2 trillion at the last count on April 9 — $1.8 trillion higher than when he took office. That’s a 12.5 percent increase under Trump. And that figure will go up even more quickly in coming years unless Trump and Congress impose massive spending cuts, or reverse course and increase taxes. Trump’s cuts in corporate and individual income tax rates — as well as the bipartisan spending deal he signed Feb. 9, 2018 — are causing the red ink to gush even faster than it did before. The annual federal deficit for fiscal year 2018, which ended Sept. 30, was $779 billion, up from nearly $666 billion the year before. U.S. crude oil production resumed its upward trend under Trump, rising 25.6 percent during the most recent 12 months on record (ending in January), compared with all of 2016. Domestic oil production has increased every year since 2008, except for a 6.1 percent drop in 2016 after prices plunged to below $30 a barrel, from more than $100 in 2014. The price returned to more than $50 a barrel by the end of 2016, prompting increased drilling and production. The price has averaged over $57 since Trump took office. As a result of this rising production, the trend to reduced reliance on foreign oil also resumed. The U.S. imported an estimated 11.4 percent of its oil and petroleum products last year — less than half of the 24.4 percent figure for all of 2016. And in January, the EIA projected that the U.S. would likely be exporting more petroleum than it imports by the end of 2020. Bureau of Labor Statistics. “Employment, Hours, and Earnings from the Current Employment Statistics survey (National); Total Nonfarm Employment, Seasonally Adjusted.” Data extracted 10 Apr 2019. Bureau of Labor Statistics. “Labor Force Statistics from the Current Population Survey; Unemployment Rate, Seasonally Adjusted.” Data extracted 10 Apr 2019. Bureau of Labor Statistics. “Job Openings and Labor Turnover Survey: Job Openings, Seasonally Adjusted.” Data extracted 10 Apr 2019. Bureau of Labor Statistics. “Labor Force Statistics from the Current Population Survey; Labor Force Participation Rate.” Data extracted 10 Apr 2019. Bureau of Labor Statistics. “Labor Force Statistics from the Current Population Survey; All employees, thousands, manufacturing, seasonally adjusted.” Data extracted 10 Apr 2019. U.S. Bureau of Economic Analysis. “Table 1.1.1. Percent Change From Preceding Period in Real Gross Domestic Product.” Interactive data extracted 10 Apr 2019. Federal Bureau of Investigation. “Crime in the United States, Jan-Jun 2018, Preliminary Semiannual Uniform Crime Report.” 25 Feb 2019. Bureau of Labor Statistics. “Labor Force Statistics from the Current Population Survey; All employees, thousands, coal mining, seasonally adjusted.” Data extracted 10 Apr 2019. U.S. Energy Information Administration. Short Term Energy Outlook. 9 Apr 2019. U.S. Border Patrol. “U.S. Border Patrol Apprehensions FY2019” Undated. Accessed 10 Apr 2019. U.S. Border Patrol. “Total Illegal Alien Apprehensions By Month Fiscal Years 2000-2018.” Undated. Accessed 10 Apr 2019. U.S. Bureau of Economic Analysis. Corporate Profits After Tax (without IVA and CCAdj) [CP], retrieved from FRED, Federal Reserve Bank of St. Louis. 10 Apr 2019. Yahoo! Finance. “Dow Jones Industrial Average.” Accessed 10 Apr 2019. Yahoo! Finance. “S&P 500.” Accessed 10 Apr 2019. Smith, Adam. “Wall Street’s Bull Market Celebrates Its 10th Anniversary.” The Street. 10 Mar 2019. Bureau of Labor Statistics. “Consumer Price Index – All Urban Consumers.” Data extracted 10 Apr 2019. Bureau of Labor Statistics. “Employment, Hours, and Earnings from the Current Employment Statistics survey (National); Average Weekly Earnings of All Employees, 1982-1984 Dollars.” Data extracted 10 Apr 2019. Bureau of Labor Statistics. “Employment, Hours, and Earnings from the Current Employment Statistics survey (National); Average Weekly Earnings of production and nonsupervisory employees, 1982-1984 Dollars.” Data extracted 10 Apr 2019. University of Michigan Surveys of Consumers. “The Index of Consumer Sentiment.” Mar 2019. National Association of Realtors. 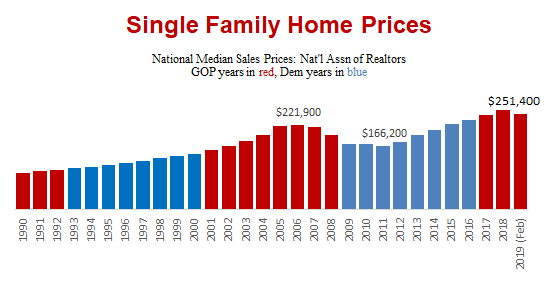 “Sales Price of Existing Single-Family Homes.” 22 Mar 2019. S&P Dow Jones Indices. “S&P CoreLogic Case-Shiller U.S. National Home Price NSA Index.” Data extracted 10 Apr 2019. U.S. Census Bureau. “Time Series: Not Seasonally Adjusted Home Ownership Rate.” Data extracted 10 Apr 2019. U.S. Bureau of Economic Analysis. “U.S. International Trade in Goods and Services, January 2019.” 27 Mar 2019. U.S. Bureau of Economic Analysis. “Table 1, U.S. Trade in Goods and Services, 1992-present.” 27 Mar 2019. U.S. Bureau of Economic Analysis. “Table 3. U.S. International Trade by Selected Countries and Areas: Balance on Goods and Services.” 27 Mar 2019. Centers for Disease Control and Prevention; National Health Interview Survey. “Health Insurance Coverage: Estimates From the National Health Interview Survey, January – September 2018.“ 27 Feb 2019. Witters, Dan. “U.S. Uninsured Rate Rises to Four-Year High.” Gallup. 27 Jan 2019. Congressional Budget Office. “Federal Subsidies for Health Insurance Coverage for People Under Age 65, 2018 to 2028.” May 2018. U.S. Department of Agriculture, Food and Nutrition Service. “Supplemental Nutrition Assistance Program (Data as of Apr 5, 2019).” Data extracted 10 Apr 2019. U.S. Department of Agriculture, Food and Nutrition Service. Supplemental Nutrition Assistance Program (SNAP) data, fiscal years 1968-2018. Administrative Office of the U.S. Courts. “Judicial Confirmations for January 2019,” archived web listing of confirmations in 115th Congress. Accessed 10 Apr 2019. Administrative Office of the U.S. Courts. “Confirmation Listing” web listing of confirmations in 116th Congress. Accessed 10 Apr 2019. Administrative Office of the U.S. Courts. “Judicial Confirmations for January 2011,” archived web listing of confirmations in 110th Congress. Accessed 10 Apr 2019. Administrative Office of the U.S. Courts. “Judicial Confirmations for January 2013,” archived web listing of confirmations in 111th Congress. Accessed 10 Apr 2019. U.S. Treasury. 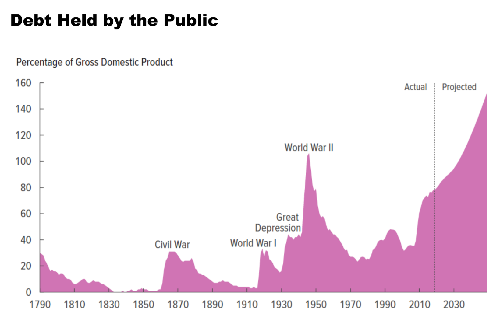 “The Debt to the Penny and Who Holds It.” Data extracted 10 Apr 2019. Congressional Budget Office. “The Budget and Economic Outlook: 2019 to 2029” 28 Jan 2019. Hall, Keith. “The 2019 Budget and Economic Outlook; Presentation to the American Business Conference, Washington, D.C.” 2 Apr 2019. U.S. Energy Information Administration. “U.S. Field Production of Crude Oil.” Data accessed 10 Apr 2019. U.S. Energy Information Administration. “Weekly Cushing OK WTI Spot Price FOB.” Weekly oil price data. Accessed 10 Apr 2019. U.S. Energy Information Administration. “Table 3.3a Petroleum Trade: Overview.” Monthly Energy Review. 26 Mar 2019.